I don't think I can explain this. The best I can do is show you what I did and the results. Ok, if you don't have DSL I think you can quit reading. But I'm not sure so maybe you want to read on. I don't know. I have AT&T's "FastAccess DSL XTREME 6.0." This is advertised as 6.0 Mbps down and 512 Kbps up. AT&T actually does pretty well delivering this. Except when I'm doing massive uploads. Understandably the uploads are limited by the upload speed but what I've been experiencing as long as I can remember is that when I'm uploading the download speed drops to dial-up. Consequently I end up queueing up big uploads for overnight. Until October 2011 I thought this was something that just affected me and I wasn't willing to arm wrestle AT&T to work on this. Then when we were in Italy I had the same experience. The "hotel" I stayed at in Manarola had DSL. Their download speed was over 10 Mbps but when I uploaded my pictures the whole Wi-Fi network slowed to a crawl. The good news is there were only 4 rooms in the "hotel" so I didn't really impact anyone else. Hmmm. The problem I was seeing must be a general DSL problem, not just something in my configuration. So I went off and Googled it. You should expect download speeds to be very seriously impacted by any file uploads that you may be undertaking at the same time. This is a normal consequence of the design of ADSL services. Read the whole article. There's lots more that I didn't understand. So I wrote it off as a DSL phenomenon and started thinking about cable Internet. But cable Internet is more expensive and, as you know, I'm cheap. So I didn't do anything. Fast forward to March 2012. 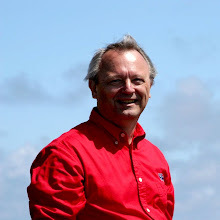 I listen to Steve Gibson's Security Now podcast on TWiT. His show on March 14, 2012 was entitled "Buffer Bloat." The best I can explain this is that modern network devices with large buffers defeat TCP's built-in self-pacing capabilities. It was pretty much over my head and it didn't seem that I could do anything about it anyway. A month later Steve had a question and answer edition. 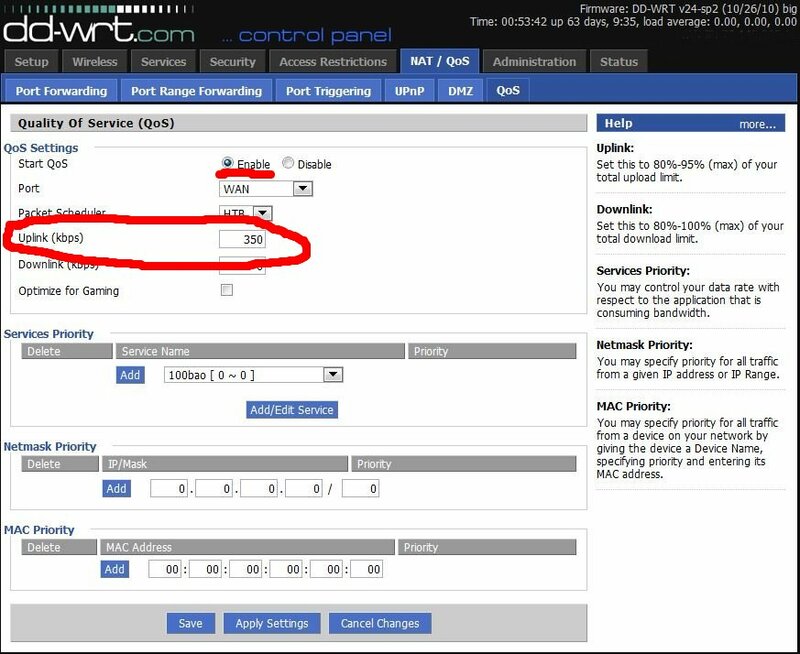 A listener had written in how he had used his router's QoS settings to manage the "Buffer Bloat" upstream from him. You can watch the question and answer here. 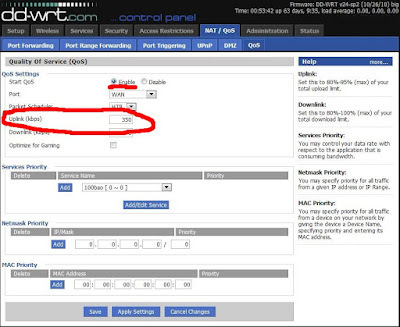 So I went into my router and found the QoS settings. I enabled them and set the uplink speed to 350 Kbps, just less than my observed upload speed.